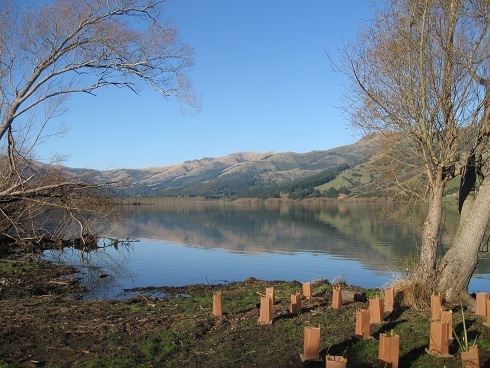 The Rod Donald Banks Peninsula Trust is supporting the Hornby Rotary Club in its efforts to replant and improve the biodiversity at Catons Bay on the shore of Te Roto o Wairewa/Lake Forsyth. This popular picnic spot off State Highway 75 was overgrown with willows and aggressive weeds including blackberry and convolvulus. The club has cleared the willows and replanted in natives. A three year grant from the Trust aims to assist the club to implement a regular professional spraying program to assist the new plants to establish and control weed competition.